I was reading some tech news this morning and came across this article on how iWork is going to compete with Microsoft Office by being free for new buyers of Apple hardware. I read the article and realize more and more that there is no fact-checking in the tech media. The article states that these apps are free for new buyers of hardware (which is true), but for old buyers, they state the prices as being $9.99 per app. When I got the App Store on my MacBook Air, these apps run $19.99 each and not $9.99 — why this discrepancy? Is it to make the $100 per year price for office look worse? The author does not add the fact that this $100 price includes 5 licenses of the software and includes alot more than the core iWork apps for this price. I really am getting more and more distrustful of tech media writing and fact checking and this is a misleading article that hammers home my point. This entry was posted in Apple, electronics, Internet, Phone, technology on October 23, 2013 by Adam Noah. As many of you know, I am all about the feedback (and feedforward) in games. I think touchscreen gaming is sorely missing the touch sensitivity, and this has some potential to improve on that, as well as make our current controllers that much better. 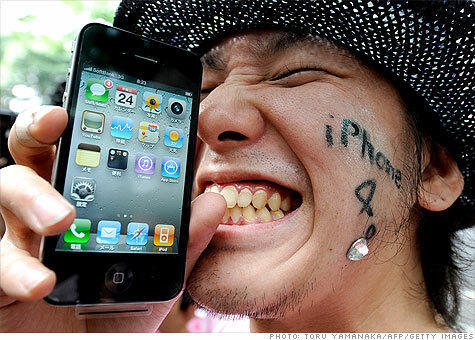 Have a look at the tech from the Engadget link here. This entry was posted in computer, electronics, Entertainment, Neuroscience, Phone, Video Games on September 17, 2011 by Adam Noah. This is a really funny play on the original iPhone commercial. Its not far off base in its humor, which is slightly sad. Hurry up with Windows Phone Microsoft!!! This entry was posted in computer, electronics, Phone, television and tagged iphone on July 14, 2010 by Adam Noah. 3. The voice service is VASTLY improved, and I have not dropped a call since I had the microcell. 1. On day one, the microcell connected at first and worked great. It immediately proceeded to lose its GPS signal (which is required for the device to work) and took hours to reconnect again. This has not happened since day one, but I am always wondering why it happened at all…. 2. AT&T is seriously saying that the data usage over the microcell counts against your phone’s data plan. This is insane, evil and is the definition of double dipping (especially if AT&T is your ISP). 3. Because of the problems on day one, I tried out a new router. That was a complete fiasco, and the router was returned IMMEDIATELY. The thing is, I the microcell is kind of picky about routers and firmwares. This could lead to future problems and compatibility issues. I am, for example, unable to get the microcell to work with any router I have except my Linksys WRT54-GL. This router has been a workhorse, but it is lacking many of the advanced features of modern routers, and I don’t like having to run an N access point in my house as well as the G just to have coverage. I can not pinpoint the problem here, but it has to do with the devices talking to each other. In summary and closing, I have to say that I am happy with the microcell, and would recommend it to others who have problems with connectivity on their AT&T phones. However, here is an interesting anecdote to think about before you decide to drop the $150 on the microcell. My friend Serge got the new 4th generation iPhone the other day and came over to my house for a few beers over the weekend. We looked at his phone and he had 5 bars in my house!! He was not connected to the microcell, but rather to the AT&T local tower. He had no problems making calls either. I am happy that the new phone works better, and would think about updating, however, this is really shifting my blame from 100% on AT&t’s shoulders over to Apple’s. If the new phone works, and the old one doesn’t is it really AT&T who is at fault? This entry was posted in computer, electronics, New York City, Phone and tagged AT&T, Brooklyn, iphone, iphone4, microcell, NYC on June 26, 2010 by Adam Noah. As many of you know, I have never been able to actually use my cell phone in my apartment. This has been an extremely annoying experience, but I had hope over a year ago when AT&T said they were going to offer microcell service. For those that don’t know, a microcell is a box that plugs into your home internet connection and transmits cellular service in your house. The theory is great, and initially, I had very high hopes. Then came the AT&T caveats (of course I expected these….) The first issue is that the microcell does not provide unlimited talk time. When you are connected to the microcell, it actually counts against your monthly allotment of talk time. This is annoying as I am providing the service (at least partially). Of course, AT&T offers an unlimited talk time on the cell for an extra $20 per month. This is WAY too high for the amount of time I am home and talk on the phone. Most of the time I am home is at night or on the weekends, so I decided immediately to bypassed this option when the microcell became available in New York City. As of the first week of June 2010, the microcell is officially available in NYC. I made my way to AT&T and bought one for $150 plus tax. Afterwards, I went home, and plugged the microcell into my router. After following the directions, and waiting about 45 minutes, the microcell was ready to use. I looked at my iphone, and didn’t notice any change. I tried to make a phone call, and was immediately greeted with the typical call failed sound. I decided to restart my phone. That did the trick — the phone was officially connected to the microcell!!! I made a call and it worked perfectly. I sent a SMS from Aki’s phone to mine and it was received!!! This was officially new territory!! Then about 30 minutes later, I realized one of the major limitations of the microcell. The box REQUIRES you to have a GPS signal so that the e-911 service works. I can understand this, but the GPS signal at apartment is very intermittent. The box was dis- and re-connecting quite a bit. I am not sure why this is, but I think it has something to do with my Linksys WRT54GL router. This router has worked well for years, but lately I noticed it looses the signal more often than it used to. To remedy this, I ordered a new router and will write more about this later. Anyway, this GPS/router issue has made the microcell less than usable. The problem is that the microcell doesn’t readily connect if it loses the ethernet or GPS signal. While the microcell is looking for the signals, the phones dont work. Once it finds the signals the phones work again (most of the time). Anyway, to close this post, I will say this — the microcell works well when it works. I have 30 days from purchase to decide if it works for me well enough to warrant the $150. The new router will be here this week, and I will see how it works. Until then here are some pics of the router. This entry was posted in computer, electronics, Phone and tagged 3g, AT&T, iphone, microcell on June 13, 2010 by Adam Noah. 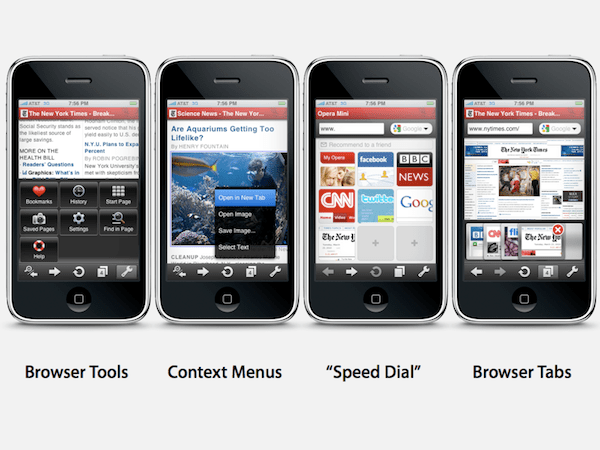 Opera Mini as default browser on iPhone. So Opera Mini got approved for usage on the iPhone the other day. I downloaded it as soon as it was available and gave it a try. Its very snappy, and works as advertised. I immediately found myself wondering how to make it the default browser as I never want to use Safari again. I remember editing Ubuntu Linux a while ago to change the default browser to firefox from Conquerer or something like that. I had to change a bunch of paths and links and aliases, but eventually Firefox worked as the default browser. I find myself wondering how can I get into my iPhone via SSH and change all the references to use Safari to Opera. This is currently high on my wish list. Does anyone know how to do this? Please let me know if you do — I will be extra grateful!! This entry was posted in computer, Phone and tagged computer, iphone, Opera, web on April 14, 2010 by Adam Noah.